Doctors and researchers have found that obesity and diabetes are connected. People who are obese are at high risk for developing Type 2 diabetes (also known as “insulin-resistant” or “adult-onset” diabetes), particularly if a close family member is affected with diabetes. Therefore, it becomes very important to maintain a healthy body weight throughout your life in order to protect yourself from developing a chronic disease like diabetes. Researchers have also determined that only a slight predisposition for obesity is inherited. For example, the best way for children to avoid being overweight is to eat a diet that is balanced and is low in fat. This diet should consist of lots of fresh fruits and vegetables. Snacks like chips, cookies, ice cream, and soft drinks should be limited or eliminated. This may require a lifestyle change in a person’s life. It is very important that all children become involved in physical activities on a daily basis. Too many children spend their free time in front of computers, television, and video games, and this results in a growing number of kids who are obese and who will likely suffer medical consequences of obesity as adults. In order to become a diabetic, two factors need to be present. First, you need to inherit a predisposition to the disease, and second, the environment must trigger a response in your body. Your genes alone are not enough. This has already been shown in studies of groups of identical twins: when one of a pair of twins develops diabetes, there is only a slightly increased chance that the other sibling will develop the disease. Because identical twins are genetically similar, the environment of the individual might play a role in the development of diabetes. However, because both genetics and the environment are shared by family members, we recognize that people with a family history for diabetes have a greater risk for developing the disease. Another factor are epigenetic marks that change with diet and the environment. 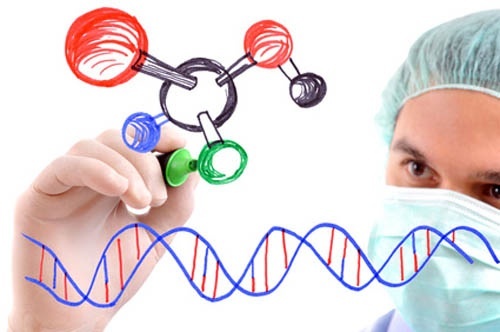 Molecular biology has shown the genetic and epigenetic basis for the development of both diseases. In recent years, expanded knowledge of the human genome has led to the development of new tools that facilitate the simultaneous analysis of thousands of genes for complex diseases. Researchers now rely on such tools in their search to uncover the gene networks associated to conditions such as diabetes and obesity. Today, geneticists use a number of forward approaches (for example, approaches that seek to find the genetic basis of a phenotype) in their efforts to understand how gene networks may contribute to these diseases. One such method is the genome-wide association study or GWAS; this high-throughput approach allows geneticists to scan the entire human genome in an unbiased manner, using statistical methods to determine associations between chromosomal loci and a given phenotype. For example, a recent genome-wide association study has reproducibly associated variants within introns of the gene FTO with increased risk for obesity and type 2 diabetes (for more information see “Obesity-associated variants within FTO form long-range functional connections with IRX3” by Smemo et al). Mutations in introns (noncoding regions) of the gene FTO have been widely investigated after genome-wide association studies revealed a strong link between FTO and diabetes. Yet, overexpressing or deleting FTO in animal models affects whole body mass and composition, not just fat, and experiments have failed to show that these obesity-linked introns affect the function of the FTO gene itself. Diabetes and obesity are directly involved since body fat and metabolism are strongly connected. This study showed that not just proteins are associated to obesity, but also non-coding regions such as enhancers and introns. Conformational changes in the DNA and epigenetics (mostly linked to diet and environmental exposure) might be the answer to better understand both diseases. However, until we completely uncover the mysteries of the genetics of metabolism, the best choice is to eat healthy and live well, independent on genetic predisposition and background. Like they say; you are what you eat. So, eat well and exercise. 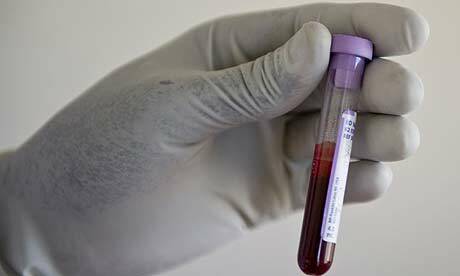 What would you do if you were tested positive for HIV in a routine blood exam? Well, this question came up after I saw the movie Dallas Buyers Club. The movie portrays the life of Ron Woodroof, who was a Texas cowboy and drug user and was diagnosed with AIDS in the 1980s. He was initially given 30 days to live, but Woodroof (portrayed by actor Matthew McConaughey) begins taking azidothymidine (AZT), the only HIV drug legally available in America at that time. Woodroof goes on to travel the world, searching for medications that will keep him alive, and as a result, the Dallas Buyers Club is formed. With the help of a doctor and another patient played by Jared Leto as a transsexual, Woodroof begins selling smuggled drugs out of a motel in Dallas, providing HIV-positive patients with alternative forms of treatment for their disease, since the FDA was still testing the drugs that are currently used. Interestingly, the storyline closely reflects the real life events of Ron Woodroof and provides a great example of how patient advocacy hastened the development of effective HIV medications during the 80s. I watched the movie and it was clear how the process of drug approval and lab testing is still rudimentary. Coming back to my question in the beginning of this blog post, what if your HIV test comes back positive? Well, what if I say that the standard tests done for HIV have problems with numerous false-positives? The main and most widely test used is an immunoassay called ELISA that measures antibodies against the virus. However, viruses are very similar and have building blocks or proteins that look alike. So, when you measure antibodies against a response of the human body for a viral infection, false-positives can occur. Indeed, I am writing this post to give people awareness that, for example, flu vaccination could cause a false positive for HIV. Like I said, the viruses are very similar. The HIV GP160 protein exists in several viruses and has a lot of similar regions (see more at this report on the New England Journal of Medicine “Influenza Vaccination and False Positive HIV Results”). This protein is present in other virions too, especially a variety of flu related viruses. Thus, vaccination against any type of flu could generate a cross-reaction in the aforementioned immunoassay. In fact, there are several reports and groups of discussion online in which the most discussed subject is a false positive test result for HIV. Yes, that is scary and weird, but it is more common that we imagine. Given the escalating international awareness of various influenza strains and flu vaccination, it is very important for clinicians and patients to keep in mind that influenza vaccination may cause cross-reactivity with HIV antibody assays. The time course for such cross-reactivity remains mostly uncertain, but could be for months. If your HIV test was positive, take into account this possibility and ask for the use of a nucleic acid amplification test instead of the “Western blot” assay to confirm the enzyme immunoassay. People should and need to be aware of that. The movie Dallas Buyers Club just reminded me how science and research can be misleading within its own “rules”. Ron Woodroof tried to overcome these rules to save lives and himself. We all need to take care of ourselves, of course, using the law to do it. The take home message is that we still do not understand enough about the biology of viruses and confusions such as the one I discuss here could happen. So be aware! 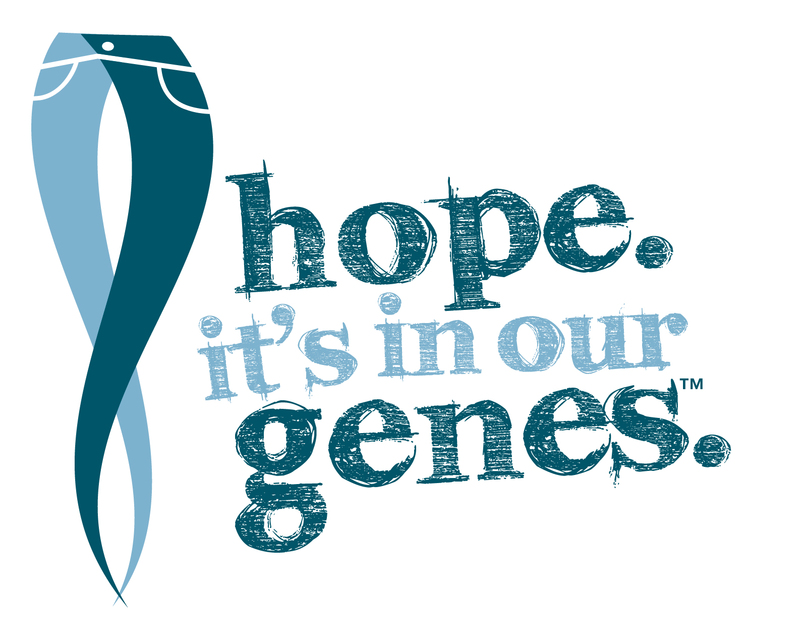 Cancer Genomes and Personalized Medicine – are we there yet? 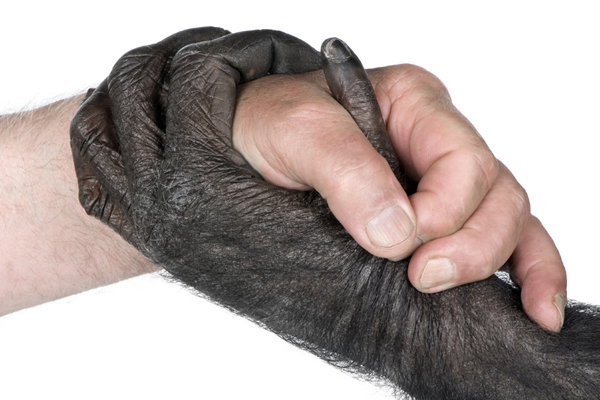 Cancer is and was always a disease that frightened humankind. The diagnosis of the disease meant a death sentence some decades ago. However, things are changing for the better. Armed with the initial human genome sequence available in 2001 and hundreds of cancer genomes, we can now use targeted drugs for specific defects in cancer cells. Treatment for the disease will not be based in the tissue the cancer came from (examples include prostate, colon, breast, brain and others) like years ago, but in the genomic features of the cancer. A tumor from brain can have similar genetic defects and resemble more a tumor from prostate or even breast compared to other brain tumors. Most of these genetic flaws that have been identified with human cancer genome projects are relative newcomers to medical terminology, as are most of the anticancer drugs, still in early testing, that are aimed at them. Development of the new drugs has been affected by the falling cost and increased speed of decoding the DNA from cancer cells and the prospects of premium prices for drugs that specifically attack the molecular drivers of cancer (for more information see the article by Anne Eisenberg in the NY Times “Variations on a Gene, and Tools to Find Them”). The web is also helping in the fight against cancer. Data repositories have been created to guide doctors and patients that suffer from cancer helping them find the right drug for their disease type. One of such tools is the portal “My Cancer Genome” created by researchers at the Vanderbilt University in Tennessee, United States. The website started two years ago and now has more than fifty contributors from twenty institutions all over the world. The website lists mutations in different cancer types, as well as drug therapies that may or may not be of benefit for patients. Most of the drugs described in the website are in clinical trials and only a few have been approved by the Food and Drug Administration (FDA). However, the portal is free and doctors, researchers, patients, relatives and institutions can access, easing the translation of the findings in research laboratories to the bedside of patients. The users can also select a type of cancer, such as “melanoma” and add a gene or gene defect, let’s say “BRAF,” for instance, or “lung cancer” and “BRAF,” and see all types of mutations in the BRAF gene that occur in those cancer types. The users can then check for national and international drug trials aimed at these alterations. Another internet tool that is focused in cancer patients is the website “CancerDriver”. This solution is a Search Engine connected to a database that facilitates the identification of the right biomarker for different disease outcomes. These solutions can use data crowdsourcing to identify specific disease types, leveraging information to the final consumer – the cancer patient. The sequencing of cancer genomes with accumulating information in databases and the use of internet solutions by health care professionals and patients will definitely facilitate cancer treatment. Personalized Medicine for cancer is already here. Now we have to make good use of it to help treating this deadly disease in the years to come. P4 Medicine – a new revolutionary approach to treat diseases? The term “P4 Medicine” was first introduced more than 5 years ago by the researcher Leroy Hood in an attempt to change medicine from a reactive to a proactive perspective. The ultimate goal of this “futuristic medicine” is to maximize wellness for each individual rather than just treat the disease. P4 stands for the letter “P” in four words: Predictive, Preventive, Personalized and Participatory (for more information see “Predictive, personalized, preventive, participatory (P4) cancer medicine” by Hood and Friend). Emerging from debates related to health care system reform and translational research, this new way of thinking about medicine has put the focus on the patients, other than the physicians. P4 medicine utilizes four interconnected aspects to improve both the effectiveness and efficiency of health management at the individual level. The first “P” that stands for Predictive medicine studies the risk factors, predispositions, and genetic susceptibilities that exist before issues arise by the use of genetic testing and genome sequencing, technologies that have evolved in the last decade. This gives the patient and their health care team warning signs long before a disease is diagnosed. It also gives information that can influence changes in the diet and lifestyle of individuals. The second “P” for Preventive medicine uses the knowledge of the risk factors learned from predictive medicine to change a person’s behavior. It also helps in pre-disease treatments and early screening helping cut off the development of more serious conditions. The third “P” is for Personalized medicine in which each individual will respond differently to treatments. This helps the physician understand what works and what does not work. 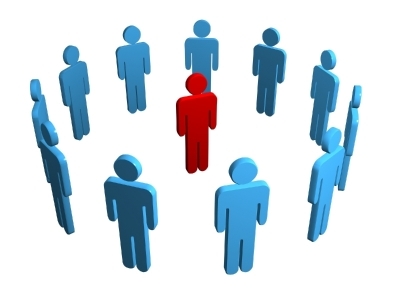 Personalized or individualized medicine studies and treats each individual as a unity and the current system of health care attempts to treat patients in a universal fashion, which is wrong. The knowledge and access to multiple treatment options as well as better predictions on what works more effectively will help patients and their health care team in selecting the treatment to best meet the patient needs, thus personalizing the medical experience. The fourth and last “P” is for Participatory medicine in which the patient and doctor relationship will become more interactive, helping in better diagnosis and effective treatments. Participation in health care decisions empowers the patient and can encourage innovation among the health care team. Importantly, the emergence of the Web 2.0 and social media websites is facilitating these interactions. Social Media is also empowering individuals to share their data with others that may have the same conditions. This new era in medicine has been shaped by technology breakthroughs such as increasing computer storage capacities and speed, the emergence of the cloud and systems biology generating tons of patient data points. This concept of enabling data and models to be shared by communities as maps of disease built in an open-source manner that includes researchers and physicians around the world will change the style and speed of discovery and development of new therapies. This revolution in medicine will also facilitate clinical trials that need to recruit a very large number of patients. It will be possible by the use of crowd-sourced recruitment bringing several centers and groups together with the use of next generation Electronic Medical Records (Next-Gen EMRs) empowered by social media tools. I truly believe that “P4 medicine”, with patients being more in charge of their own health data, will change the way we approach and treat diseases. That is indeed a medical revolution! Translational research and applied medicine – are we all lost in translation? In this blog post today, I will share some experiences in my day-to-day life doing (or trying hard to do…) translational research. Just to be clear there are two main types of research: 1) basic, which tries to understand the fundamental principles and phenomena that drive cells, organisms, systems and the world we live in; and 2) translational, which is the application of the basic research to solve specific problems, aid in diseases and help the society at different levels. In health sciences, translational research has its focus on removing barriers to multidisciplinary collaboration between scientists and physicians helping to “translate” basic discoveries in new drugs to treat diseases and/or the identification of better ways to manage chronic diseases such as cancer, diabetes, etc. Importantly, translational research has the potential to drive the advancement of applied science. It is also an attempt to bridge the medical and scientific domains to move discoveries “from bench to bedside” or from laboratory experiments through clinical trials to actual point-of-care patient applications. Well, it is pretty and fancy to say that you are doing translational research, since the chances that your research will help improve patient care are always higher. I can tell using my personal experience that this is a very complicated and entropic process. As in any field, communication is key to success. For example, in project management, business, finance, and etc, communication has to be the most important feature in the path to success. The same applies to multidisciplinary projects involving scientists, project managers and physicians. The problem is that it is not like this. Physicians have different expectations compared to scientists and I have a feeling that I am always “lost in translation” and vice-versa. The success of any project depends not just in commitment from the personal involved but also good communication skills between the people that are involved. 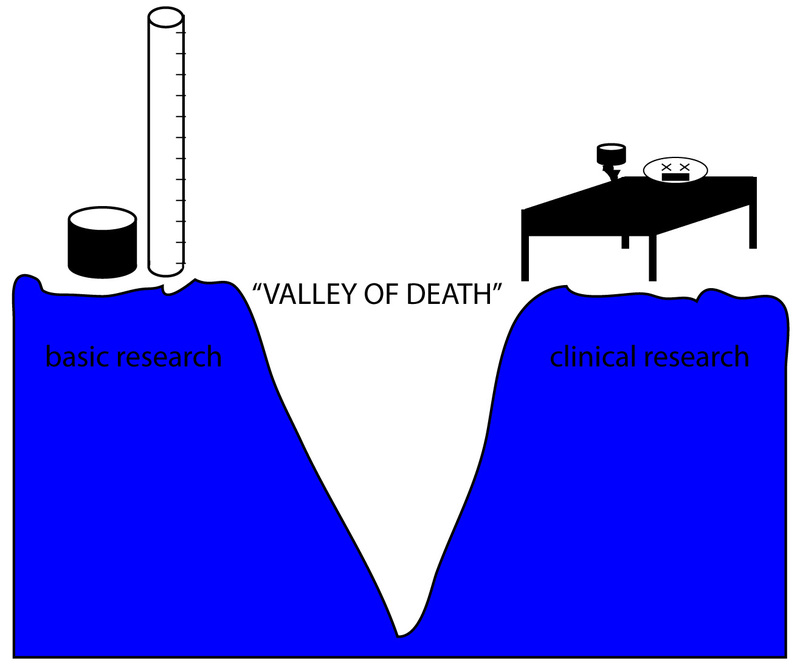 It is like in the cartoon above, there is a “valley of death” between both parts mainly because the exchange of information is faulty. Well, we are in need for better ways to facilitate the communication between professionals with different backgrounds, especially when doing translational research. The physician needs to understand and be interested in the scientific side of the project (read more, study more, be curious about science which sometimes is not the case…) and the scientist has to understand the physician’s needs and the problems he or she wants to find answers in order to increase the rates of success. My feeling is that none of this happens and the environment between both sides is indeed entropic with constant miscommunication. Improvements in both sides for a better information exchange are crucial to develop multidisciplinary projects with impacts for patients suffering from diseases. New discoveries doesn’t depend just on working hard towards a goal, there might be a synchrony between researchers and doctors so the rate of success will increase extraordinarily. Finally, I believe that both parts need to learn more about Project and Finance Management, especially in though times with shortage of money for research. I think this is not an isolated case and this may happen in a lot of institutions around the world. So, let’s step back for a while and think on how to maximize our chances of better communication and, consequently, of success in translational research.